Financial aspect: Lack of fund. Technical aspect: Availability of defluoridation kits and plants. Social aspect: Lack of maintenance of the technical solutions implemented. To determine and compare fluoride level in water samples from Fluorosis Mitigation Plant and Borewell from project area. Among eight grampanchayats of Pavagada taluk, Tumkur district, three villages (K T Halli, Navagram and Veeralagondi) were included in the present study according to the convenience of reaching the places. This study was conducted in the period of December 2010 to February 2011. 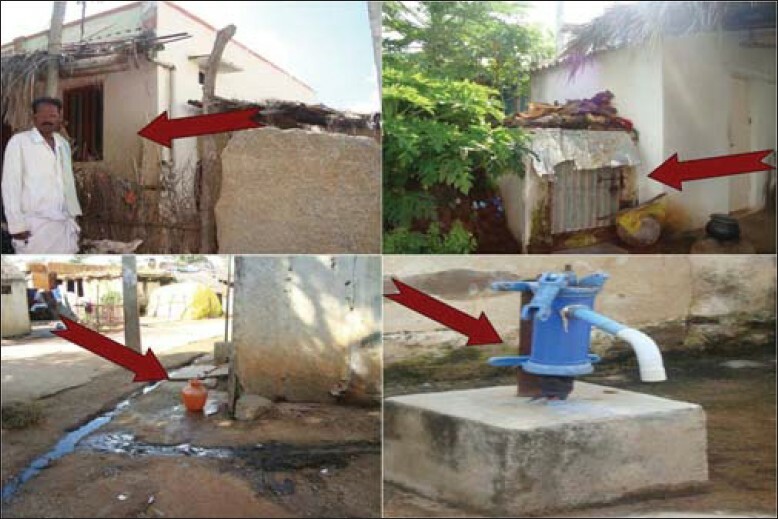 Thirty sample of water from the mitigation plants [Figure 1] and eighteen sample of water from the bore wells in three villages (K T Halli, Veeralagondi, Navagram) were collected in sterile containers in an unannounced visit. All the samples of water were assigned a code so that those undertaking analysis would be blind to the source. Fluoride levels were determined by a Spectrocolorimetric method  in Department of Civil Engineering, Siddaganga Institute of Technology, Tumkur. Statistical analysis was done following descriptive analysis and unpaired student t test was used to compare the mean. P value less than 0.05 was considered to be statistically significant. [Table 1] shows the Grampanchayats and villages of Pavagada taluk, Tumkur district involved in the project. 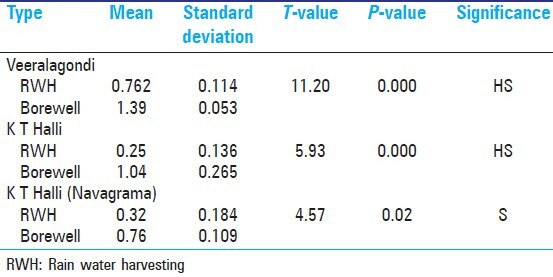 [Table 2] shows the fluoride concentration of the test samples. 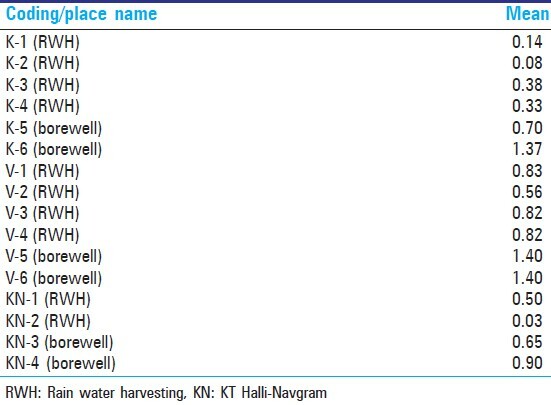 The value ranged from 0.03 to 0.83 in mitigation plant water samples and in borewell samples it ranged from 0.65 to 1.40. [Table 3] depicts comparison of fluoride content from mitigation plant and bore water in 3 different places. The difference was statistically highly significant showing fluoride content more in bore water and the water samples from mitigation plant was below optimum level of fluoride in drinking water. Pictures 1 and 2 shows the present status/demolished tanks. The present study showed fluoride level was above optimal level in the water samples from the borewell water in the mitigation area which was similar to the baseline report produced by BAIF to the government of Karnataka. In the water samples collected from the mitigation plants, fluoride level was below optimal levelconfirming it has succeeded in reaching the goal of the project. Even though the fluoride level was within the normal range (0.03-0.8 ppm) in the water samples from the mitigation plants, ground reality was different. According to Agro climatic condition the average rainfall is 494.6 mm annually in Pavagada taluk and as rainfall is meager the area is declared as dry zone (Source: Taluk Panchayat office and Agriculture department). And out of 250-300 houses in the village, the plant was implemented only in 8-10 houses of which few were not in working condition when the project was still in progress. Even though the fluoride level was within the normal range (0.03-0.8 ppm) in the water samples from the mitigation plants, ground reality was different. And whenever a project involving public private partnership is considered, first and foremost it should be need based and there should be interaction of proper planning, monitoring and regular reinforcement. Failure in any one of the things the project will work only on papers but won't reach the beneficiaries. I would like to thank and acknowledge My father and ADA, Department of Agriculture, Pavagada for their support. I would like to extend my personal thanks to Dr. Kashinath, Principal, SSDC, Tumkur and Dr. J. V. Bharateesh for helping me during the study. 1. Vijay. The fluoride and arsenic problem in India. May 14, 2010-12:48. Available from: http://www.indiawaterportal.org/node/897. [Last Cited on 6 Oct 2011]. 2. Paramashivam R. Proposed Karnataka Rural Water Supply and Environmental Sanitation Project - II (World Bank Assisted) Environmental Analysis Study-Final Report. July 2001. Available from: http://www.wds.worldbank.org/servlet/./WDSP/./2001/./multi0page.txt. [Last Cited on 15 Apr 2012]. 3. Fluorides, nitrates in water crippling villagers; Wash news Asia and Pacific, October 29/2010. Available from: http://washasia.wordpress.com/tag/groundwater-pollution. [Last Cited on 17 Oct 2011]. 4. National Oral Health Survey and Fluoride Mapping 2002; Karnataka. Dental council of India 2002-2003. 5. Gupta P. A study of the fluorosis mitigation project in Mundargi Taluk, Karnataka in India: Master′s Project, Advisor: Shimon Anisfeld; 2006. Available from: http://www.indiawaterportal.org/./indiawaterportal./A%20mid-/pdf [Last Cited on 6 Oct 2011]. 6. Thakur YA, Dyasa VB, Kulkarni MN. Ensuring safe drinking water through innovative technologies to eradicate fluorosis-Sachetana Project-Information manual. Pub by BIRDK and Govt of Karnataka, Dept of Rural Dev and Panchayat raj 2007. Available from: http://www.indiawaterportal.org/channels/water-quality/case-studies. [Last Cited on 17 May 2011]. 7. Rikshith PK. Studies on estimation of fluoride and defluoridation of drinking water - A project report. Thesis submitted to dept of Chemical engineering, Indian Institution of Science. 2004. Available from: http://www.textroad.com/./J.%20Basic.%20Appl.%20Chem.,%201(6) 33-3. [Last Cited on 22 June 2011]. 8. Dyasa VB, Ganga Ankad. A Baseline report of Sachethana Drinking Water Project; Pub by BIRD-K and Govt of Karnataka, Dept of Rural Dev and Panchayat raj. 2006. Available from: http://www.indiawaterportal.org/channels/water-quality/case-studies. [Last Cited on 17 May 2011]. 9. A report on climatic conditions of Pavgada taluk, Tumkur District. 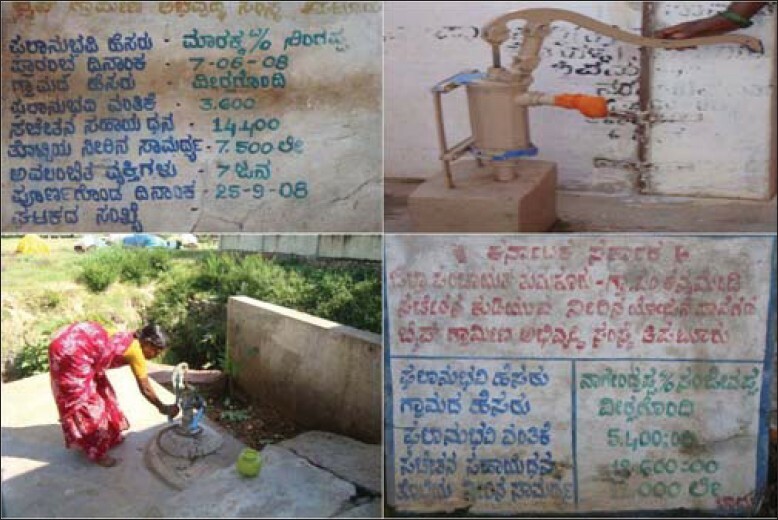 Pavagada: Source from Taluk Panchayat office and Agriculture department; 2011-12. 10. Padma CM. An insight into defluoridation measures in. Nalgonda District - Andhra Pradesh: IAPHD; 2006. p. 1-5.